ST. PETER, Minn. – The No. 5-ranked Gustavus women’s hockey team earned a series sweep over the University of Wisconsin-Superior Tuesday evening, led by a hat-trick performance from Diana Draayer (Sr., Deephaven, Minn.) and an Erica Power (Sr., Lakeville, Minn.) game-winner. Although the Gusties saw their three-goal lead slip away in the third period, Power’s game-winner with just over a minute remaining and Draayer’s empty net hat-trick goal guided Gustavus to victory. The Black and Gold claimed a 3-0 lead through the midway point of the second period. Draayer and Kaitlyn Klein (Sr., Plymouth, Minn.) gave Gustavus a 2-0 lead after the first period. Draayer deflected an Erin Moes (Jr., Hastings, Minn.) shot from the point to put the Gusties on the board at 11:38 prior to Klein notching her team-leading 16th of the season unassisted at 16:53. Gustavus owned a 15-6 shot advantage over the Yellowjackets through the first 20 minutes. Lauren Tremblay (Fy., Hayward, Wis.) earned her first collegiate start in net and tallied six saves. At the 9:02 minute mark of the second period, Draayer picked up her second of the game, collecting a pass from Klein to give the Gusties a three-goal cushion. 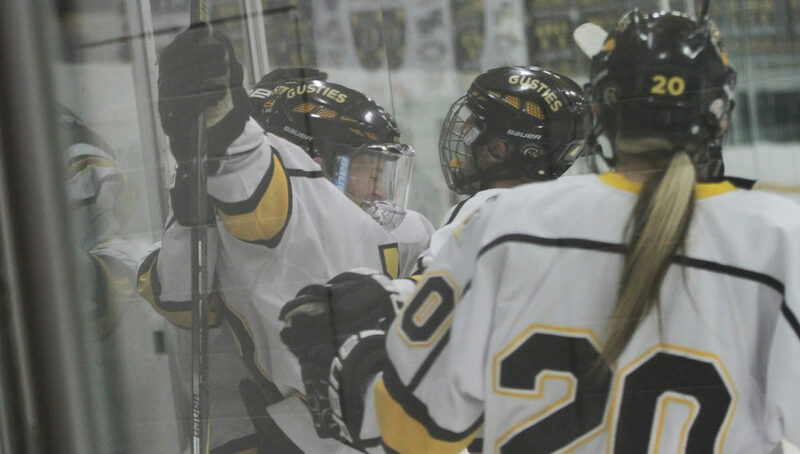 However, UW-Superior surged back with three consecutive goals, scoring twice in the third period. UW-Superior’s top goal-scorer in Kaleigh Martinson was found open in the slot and converted past Bailey Jackson (So., Chaska, Minn.) to get the scoring started, while they added another off a loose puck in the crease to cut the Gustavus lead to 3-2 heading into the final frame. The Yellowjackets continued to put forth pressure in the third period, eventually tying the game at 10:34 as a rising shot found the net past Paige Press (Jr., Cottage Grove, Minn.). With under two minutes remaining and the score still knotted at 3-3, an icing forced the visitors to take a timeout with an offensive zone draw for the Gusties. Soon after winning the faceoff, Power finished a nice back-door pass from Klein for the game-winning goal at 18:43, her sixth of the season and third game-winner. Draayer completed the hat-trick with an empty net goal with four seconds left to seal the 5-3 win, her second hatty of the season and third of her career. “We had a couple nice goals and of course the last one was a beautiful goal. It was a good confidence boost for us, especially coming off of a loss,” Carroll commented. Press recorded her first win of the season in net, posting seven saves in the third period. The Gusties finished the game with a 29-21 shot advantage while going 0-for-3 on the man advantage. Klein finished the game with a career-high three assists. The Gusties, now 11-2-2 overall, snap the Yellowjackets’ nine-game winning streak, and return to action this weekend as they head back into Minnesota Intercollegiate Athletic Conference play with a series versus Augsburg University.